Before the development of the trabeculectomy, the available surgical methods of intraocular pressure (IOP) reduction had a high rate of serious complications such as hypotony, flat anterior chamber and endophthalmitis. Thus, in an effort to improve the safety of IOP-lowering surgery, the guarded filtering procedure was developed. Cairns was the first to report success using the trabeculectomy in 1968. Cairns' trabeculectomy, with some improvements and modifications at various steps, is still being performed today. Trabeculectomy involves the creation of a fistula connecting the anterior chamber and the subconjunctival space. This provides an alternative method of aqueous humor filtration when the natural trabecular outflow pathway is blocked or poorly functioning in cases of glaucoma. The goal is to create the right amount of flow without causing overfiltration. Its success relies on the continued patency of the fistula and the continued ability of the filtering bleb created out of the conjunctiva to absorb aqueous. Thus, the success of the procedure lies not only on the surgical technique but also in the intraoperative and postoperative measures to modulate wound healing. See the image below. Flow of aqueous after a trabeculectomy. Trabeculectomy can be performed for all types of glaucoma. However, in many types and stages of glaucoma the ideal initial treatment is something other than trabeculectomy (eg, topical medication is often the first-line treatment for primary open-angle glaucoma). The challenge lies in deciding when to choose trabeculectomy over other treatment methods that are appropriate for a particular case. The risks and potential benefits of trabeculectomy must be weighed against the risks and potential benefits of the patient's current therapy (if any). The type and stage of the glaucoma and the presence of comorbid conditions (eg, cataract) must also be considered. Alternative glaucoma treatments include medication, laser procedures and other incisional surgical procedures such as glaucoma drainage device implantation. Trabeculectomy can be performed under local anesthesia (retrobulbar, peribulbar, subconjunctival, or topical) or general anesthesia depending on patient and surgeon preference, on the patient's general health status, and on the estimated duration of the procedure for that particular case. Magnification: An operating microscope is recommended, but a powerful binocular loupe can be used if a microscope is not available. Surgical instruments: The basic ophthalmic microsurgical instrument set is needed. Hemostasis: Electrocautery or diathermy is recommended. A heated metal cautery method is not recommended because of the difficulty controlling the amount of heat delivered. Excessive tissue contraction is often induced by this method. Anterior chamber opening/sclerostomy: A trabeculectomy punch (eg, Kelly) is recommended for more precise and controlled excision of the corneal block (sometimes inaccurately called the trabecular block) but this step can also be performed using forceps, a blade, and Vannas scissors. The patient is supine and the surgeon is seated superior to the patient's head if the procedure is performed at the superior or superonasal limbus. If the procedure is done at the superotemporal limbus, the surgeon may opt to sit superotemporal to the patient's head. Determine target IOP. Lower IOP needs more intensive anti-inflammatory therapy and looser flap sutures. Consider type of glaucoma. This influences the target IOP and the risk of aqueous misdirection. Review risk factors for failure. More risk factors needs more anti-inflammatory/antifibrotic therapy. Consider using antifibrotic agents (for lower target IOPs and higher risk of failure). Determine route, dose, and duration of corticosteroid treatment. Consider need for postoperative cycloplegia (especially for shallow anterior chambers such as in angle-closure glaucoma). Plan tightness of scleral flap sutures (target IOP, risk of hypotony). Discontinue anticoagulant medications, if possible. Postoperative scarring increases the risk of failure of the trabeculectomy. Topical corticosteroids started a few days before surgery are often sufficient. Consider oral steroids or peribulbar injection of steroids for high-risk cases. If subconjunctival anesthesia is used, take care to avoid inducing a subconjunctival hemorrhage. If peribulbar or retrobulbar anesthesia is used, excessive amounts of anesthetic could cause a tight orbit and elevated IOP during the procedure. General anesthesia can markedly lower IOP, so the dose and type of preoperative IOP-lowering treatment should be adjusted for such cases. To improve the exposure of the conjunctiva and limbus at the surgical site, the eye needs to be rotated in the direction opposite from the surgical site. An extremely cooperative patient under subconjunctival or topical anesthesia may be able to do this voluntarily, but in most cases a traction suture is needed. A corneal traction suture does not puncture the conjunctiva, can be placed at various locations and can pull the eye in different directions depending on where it's anchored. However, corneal perforation is a possibility. To place a corneal traction suture, a 7-0 or 8-0 nonslippery suture (eg, silk or polyglactin) on a spatulated needle is passed through one half to two thirds of the corneal thickness parallel to the surgical site approximately 1-2 mm away from the limbus. The eye can then be pulled in the direction desired and the suture is anchored to the drapes using sterile tape or a clamp. Alternatively, the corneal traction suture can be placed near the inferior limbus and the suture looped through the inferior arm of a wire speculum lid retractor, which acts like a pulley. The placement of a superior rectus traction suture is familiar to those who perform extracapsular cataract extraction. However, it is a blind procedure and could cause subconjunctival bleeding. Although the conjunctiva is perforated, a leak from the superior rectus traction suture site is extremely unlikely. To place a superior rectus traction suture, the superior rectus muscle (and the overlying conjunctiva) is grasped near its insertion and pulled away from the sclera using large-toothed forceps. A 4-0 or 5-0 nonslippery (eg, cotton or silk) suture on a round needle is then passed under the muscle and anchored superior to the eye to induce downward rotation of the globe. Anterior chamber (AC) access must be established prior to entering the AC at the surgical site. This allows the surgeon to manipulate the AC depth and the IOP by injecting or removing fluid. The paracentesis site or side port can be made using a needle or blade. The wound track should be directed away from the lens and parallel to the iris to avoid inadvertent lens injury. Some surgeons prefer to perform the paracentesis only after the antifibrotic agent has been applied because of fear of the antifibrotic agent entering the AC. See the image below. The paracentesis should be placed at an easily accessible point and should be directed away from the lens as in this example of a right eye. Inflammation causes scarring and closure of the newly created fistula. Gentle handling of the conjunctiva is essential to reduce inflammation. Sharp scissors for cutting the conjunctiva and nontoothed forceps for grasping the conjunctiva are needed. The Tenon capsule, and not the conjunctiva, should be grasped whenever possible. The advantages of a fornix-based flap are the relative ease of achieving good scleral exposure and the absence of a scar that could potentially limit the posterior flow of aqueous. The disadvantage of a fornix-based flap is the relative difficulty of ensuring a watertight closure at the limbus. When performing a fornix-based flap, the conjunctiva needs to be cut close to the limbus but not so close as to injure to the limbal stem cells. Avoid leaving large, irregular conjunctival tags that could interfere with scleral flap dissection. A small radial relaxing incision can be made at one or both ends of the limbal incision, if needed. Without dissecting the conjunctiva excessively, the Tenon capsule insertion, which is located approximately 2 mm away from the limbus, is exposed and Tenon capsule is released from its insertion. The dissection is then carried out in the sub-Tenon plane. There is no need to separate the conjunctiva from the Tenon capsule. An alternative to a pure fornix-based conjunctival flap is to leave a narrow conjunctival skirt approximately 1 mm wide attached to the limbus. This allows for a more watertight conjunctiva-to-conjunctiva closure and is less harmful to the limbal stem cells. When performing a limbus-based flap, the conjunctiva and Tenon capsule are incised as far away from the limbus as possible. Ideally, this is done approximately 8-10 mm from the limbus. Closer than that could cause scarring too close to the scleral flap. Further than that makes exposure of the limbus very difficult. Some surgeons prefer to incise the conjunctiva and Tenon simultaneously while others prefer to do it in layers. The conjunctiva and Tenon capsule are dissected away from the episclera and sclera. 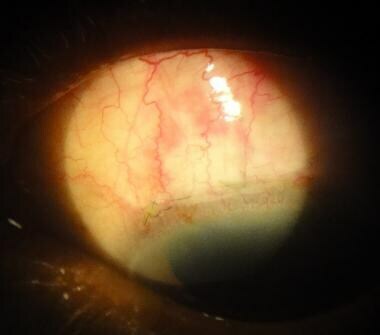 Separating the episclera from the sclera should be avoided to prevent persistent bleeding and scarring. Westcott scissors are used to bluntly dissect large sub-Tenon pockets in the preferred direction of aqueous flow (posterior). Light cautery is used to achieve hemostasis. Excessive cautery should be avoided to prevent contraction or shrinkage of the scleral flap. The use of antifibrotic agents is one of the major modern improvements on Cairns' original trabeculectomy. Antifibrotic agents, specifically 5-fluorouracil (5-FU), were first used postoperatively as subconjunctival injections by Heuer and colleagues in 1984  to suppress scar formation and preserve the patency of the filtering fistula. Later, Chen introduced the intraoperative application of mitomycin-C (MMC). 5-FU can be used both for intraoperative application and postoperative injection. [7, 8] The use of MMC as a postoperative injection has been reported  but is not as widely accepted as 5-FU. Although both 5-FU and MMC are effective at improving trabeculectomy success [11, 12, 13] , some evidence shows that MMC-enhanced surgery achieves lower pressures  . However, it appears to be associated with a greater risk of complications. In February 2012, the FDA approved a specific mitomycin product (Mitosol) indicated for adjunct to ab externo glaucoma surgery. It is available as a kit that contains the lyophilized drug (0.2 mg/vial), as well as the diluent, sterile sponges, tuberculin syringes, disposal bag, and other needed equipment for the procedure. The antifibrotic agent can be applied to the scleral bed before or after the scleral flap is cut. Any absorbent material or sponge that does not fragment when soaked (eg, instrument wipe or cellulose sponge) can be used to apply the antifibrotic agent. Contact of the antifibrotic agent with the wound edges should be avoided. The antifibrotic-soaked sponges should be applied to the area where aqueous flow is desired and should not be placed too close to the limbus in the case of fornix-based conjunctival flaps. After all the sponges have been removed, the site is irrigated with copious amounts of saline solution to remove any excess antifibrotic agent. The concentration of 5-FU used intraoperatively is 50 mg/mL applied for up to 5 minutes. The concentration of MMC used intraoperatively ranges from 0.1-0.5 mg/mL applied for 2-5 minutes. The concentration and duration depend on the risk of failure in a particular case. Some surgeons prefer to keep the concentration constant while adjusting the duration while others prefer the opposite. Recently, the alternative technique of intraoperative injection of MMC into the sub tenon space before the start of conjunctival dissection  has become popular. This technique avoids the use of sponges, saves time, and allows precise control of the dose of antifibrotic (usually 10-20 mcg). A partial thickness limbus-based scleral flap is outlined using the cautery tip or by indenting the sclera. The edges of the flap are cut with a sharp blade angled perpendicular to the globe. The flap is then lifted and dissected between scleral lamellae toward the limbus. Keeping the dissection in the same plane all the way to the limbus produces a flap of even thickness throughout. As the flap dissection approaches the cornea, the blade should be angled slightly anteriorly, following the curvature of the peripheral cornea, to avoid premature entry into the AC. Alternatively, a crescent knife can be used to cut a flap pocket before cutting the sides using scissors. The flap must be handled gently and grasped only at its edges. See the image below. As the scleral flap dissection approaches the limbus, the blade should be angled more parallel to the corneal curvature (green dashed line arrow) to avoid premature entry or entry into the anterior chamber that is too close to the iris plane (red dashed line arrow). The flap should be approximately one third to one half of the scleral thickness. A flap that is too thick could hamper aqueous flow and a flap that is too thin could become very fragile. The flap can be rectangular, triangular, square, or parabolic. There is no evidence of superiority of one flap shape over any other. The size of the flap varies, but, ideally, it should be around 2-3 mm radially by 3-4 mm wide. The minimum size of the scleral flap is such that there is at least a 1 sclerostomy wide space between the edge of the sclerostomy and the outer edge of the flap. See the image below. The ideal flap size in relation to the sclerostomy. 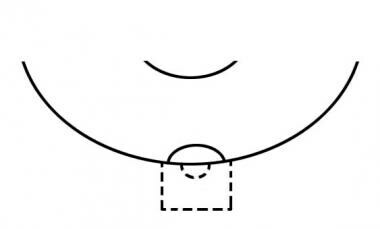 The distance between the flap edge and the sclerostomy edge should be greater than or equal to the width of the sclerostomy. The internal scleral flap dissection should extend all the way to the peripheral cornea to ensure that the sclerostomy will be made well anterior to the iris plane. This is especially important in eyes with shallow ACs to prevent the iris or ciliary body from becoming incarcerated in the sclerostomy. Thus, the term sclerostomy has become a misnomer because the tissue excised from under the anterior limit of the scleral flap is actually peripheral cornea. See the image below. Diagram showing the ideal extent of internal dissection under the scleral flap and the ideal extent of the flap sides (external). The AC is entered at the anterior limit of the scleral flap using a blade. The blade should be angled more posteriorly than the plane of dissection of the flap. Avoid causing the wound to gape during this step to prevent excessive AC shallowing. See the image below. At the anterior limit of the scleral flap the blade is redirected parallel to or towards the iris (green dashed line arrows, left). The "sclerostomy" is actually corneal tissue anterior to the trabecular meshwork/Schlemm canal (right). The posterior edge of the incision into the AC is then excised using a punch (eg, Kelly or Gass), blade, or scissors. When using a punch, ensure that the full thickness of the tissue is caught between the punch blades to avoid creating a lamellar or imperforate sclerostomy. The size of the sclerostomy depends on the amount of flow desired and the size of the scleral flap (refer to the Scleral flap dissection section above). The iris is then grasped through the newly created opening using forceps and a peripheral iridectomy is cut using small, sharp scissors. The base of the iridectomy should be wider than the sclerostomy to prevent incarceration of the iris into the wound. The iridectomy should be small and superior enough so that it is hidden by the upper lid to avoid causing diplopia or glare. See the images below. The peripheral iridectomy should have a broad base that is wider than the sclerostomy. 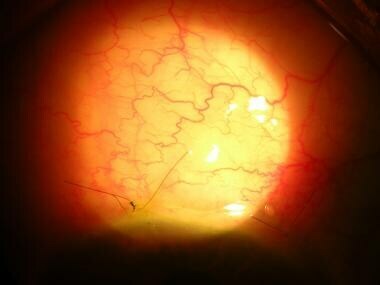 Photograph showing an eye after trabeculectomy. The peripheral iridectomy is ideal in its shape, size, and location. The scleral flap is closed using simple interrupted, releasable, or adjustable 10-0 nylon sutures, or a combination of these. The sutures are placed at the flap edges taking care to avoid puncturing the part of the flap overlying the sclerostomy. 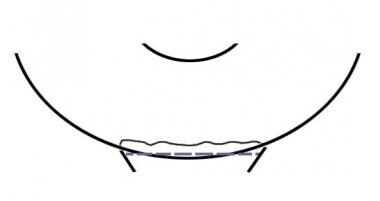 Areas where the flap is too thin should also be avoided. The suture knots should be buried to avoid the suture "whiskers" from poking through the bleb. Various releasable [18, 19, 20, 21] and adjustable [22, 23] suture techniques have been described. Both releasable and adjustable sutures are more difficult to place than simple interrupted sutures. Releasable sutures allow the surgeon to remove sutures at the slit lamp without the need for an argon laser (laser suture lysis). This is used to lower the postoperative IOP if it is higher than desired. Adjustable sutures, on the other hand, allow the loosening (or even tightening  ) of the suture to titrate the flow through the flap. See the images below. A commonly used releasable suture technique. Left eye 2 weeks after surgery. A releasable suture at the superonasal corner of the scleral flap is visible beneath the conjunctiva. The releasable suture at the superotemporal corner had been removed previously. There is a releasable suture (blue) at the superonasal corner of the scleral flap. The flap is outlined in green. The simple interrupted scleral flap sutures and conjunctival anchoring sutures are in black. Left eye immediately after removal of a releasable suture. The flap outline and the simple interrupted flap sutures are no longer visible due to the increased bleb elevation. After the first few flap sutures have been placed, the aqueous flow through the flap is assessed. First, the AC is reformed by injecting fluid through the paracentesis track. Then, using a small sponge, the flap edges are dried and the amount of aqueous leakage and the stability of the AC are observed. If the AC shallows quickly or there is excessive flow of aqueous, sutures can be added or loose ones replaced. If there is no flow through the flap, the AC will remain formed and the globe may be tense. In this case, the existing sutures can be loosened by gently stretching them or tight sutures replaced with looser ones. An indication of the ideal flow rate is when it takes several seconds for the bottom of the gutter around the flap edges to fill with fluid. However, the flow rate endpoint depends on the target postoperative IOP and the surgeon's preference. It is better to err on the side of too little flow because there are many effective and noninvasive remedies for postoperative high IOP (eg, IOP-lowering medication, laser suture lysis, releasable sutures, release of fluid through the paracentesis track) but there are hardly any for excessively low postoperative IOP. When there is a satisfactory amount of aqueous flow through the flap and the flap suture knots are buried, conjunctival closure can begin. As is the case during the initial dissection of the conjunctiva, the conjunctiva should be handled gently and only Tenon capsule grasped whenever possible. Nylon 10-0 sutures with a round (vascular) needle are preferred. Absorbable sutures can be used but they may induce conjunctival inflammation. Spatulated (side-cutting) needles can also be used when suturing the conjunctiva to the limbus (fornix-based flap). However, using a spatulated needle to suture conjunctiva is more likely to cause a conjunctival buttonhole or tear than a round needle. Limbus-based conjunctival flaps can be sutured using a simple running or an interlocked running suture. It can be closed in layers or the Tenon capsule and conjunctiva can be closed together. There should be no tags of Tenon capsule protruding from the wound as these could cause leakage or fistula formation. Fornix-based conjunctival flaps are more difficult to close. The closure can be conjunctiva-to-cornea if the conjunctiva was cut flush with the limbus or conjunctiva-to-conjunctiva if a narrow skirt of conjunctiva was left attached to the limbus. First, the rolled up edges of the distal conjunctiva are gently unrolled. For conjunctiva-to-cornea closure, the conjunctiva is then stretched to slightly beyond its original insertion. Simple interrupted or purse-string sutures are used to anchor the nasal and temporal edges of the conjunctiva to slightly beyond their original position (called the "wing sutures"). The conjunctiva becomes stretched between the nasal and temporal wing sutures and this is confirmed if an indented line is seen running from the nasal to the temporal wing sutures. The conjunctiva should be watertight at this point, leaking only when pressure is applied to the bleb. See the image below. 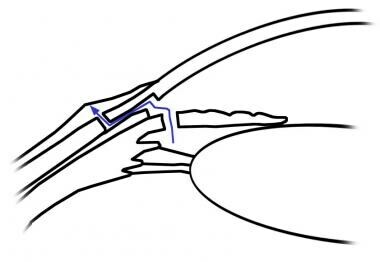 In a fornix-based flap, after the 2 wing sutures have been placed, a tension line (blue dashed line) may be seen running between the 2 sutures. This is a good indicator that the wound is already watertight. This is also a good reference point for the placement of the limbal mattress sutures. For added safety, a few mattress sutures can be used to anchor the conjunctiva parallel to the limbus along the indented line created by the placement of the wing sutures. All sutures should be placed or tied in such a way that the knots are buried beneath the conjunctiva or within the limbal tissue. If burying the knots is not possible, the suture ends can be left slightly long to reduce the foreign body sensation that would be caused by protruding short suture whiskers. For conjunctiva-to-conjunctiva closure, the conjunctival edges are apposed using a running suture or a few mattress sutures. If aqueous was flowing through the scleral flap, a bleb would have formed during the closure of the conjunctiva. The bleb can be pressed gently using a sponge and the wound observed for leakage. Sterile fluorescein dye can be used as an adjunct for this step. If the scleral flap was closed tightly, a bleb can be induced by indenting the sclera beside the flap. The proper postoperative care of a trabeculectomy is as important as good surgical technique. A technically perfect trabeculectomy surgery could still fail if necessary postoperative interventions are not performed in time. The challenge of postoperative trabeculectomy management lies in recognizing that there is a need for a postoperative intervention, choosing the type of intervention needed, and intervening at the right time. The bleb appearance, IOP, and anterior chamber status are routinely checked in the posttrabeculectomy period. Gonioscopy and dilated fundus examination are also performed when indicated. See the image below. A conjunctival bleb a few days after trabeculectomy. The bleb is of an ideal height and is diffusely elevated. Although it has slightly dilated blood vessels, they are not excessively tortuous. The limbal sutures should have been buried or tucked under the conjunctiva. All preoperative IOP-lowering medications are discontinued after the trabeculectomy. Topical antibiotic eye drops are the standard of care. Systemic antibiotics are needed only for special circumstances (eg, breach in sterile technique). Topical corticosteroid eye drops are used postoperatively. The dose of the steroid depends on the degree of scarring expected. High-risk cases can be given subconjunctival or peribulbar depot injections or oral steroids. Topical steroids are usually used for at least 6 weeks postoperatively, but the duration depends on the level of inflammation in the bleb and on the presence of risk factors for failure. Atropine eye drops can prevent postoperative aqueous misdirection syndrome (malignant glaucoma). This is especially important in eyes at risk of aqueous misdirection such as angle-closure glaucoma cases or those with shallow anterior chambers, but some surgeons prefer to use this routinely. However, atropine eye drops cause mydriasis, which can be disturbing or uncomfortable for the patient. Atropine is usually given 3 times a day initially then slowly tapered over several weeks. Severe bleb inflammation (severe congestion, presence of corkscrew vessels) can be managed using subconjunctival injection of 5-FU (5 mg in 0.1 mL) or MMC. The site of injection depends on surgeon preference but the trend now is to inject the antifibrotic adjacent to or into the bleb rather than away from the bleb. The injection can be repeated several times depending on the response of the bleb. This measure has the greatest potential for success if done in the first 2 weeks postoperatively (up to 4 weeks if intraoperative mitomycin-C was used). The potential complications of this injection are severe corneal epithelial toxicity and early or late bleb leak. 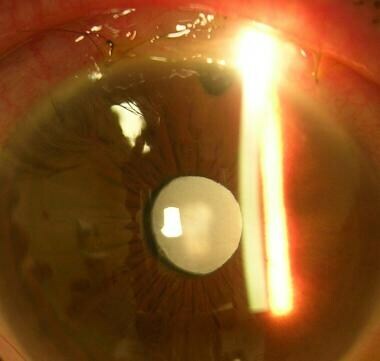 The corneal toxicity can be minimized by irrigating the eye after injection to wash away antifibrotic agent that may have leaked from the injection site. See the image below. Corkscrew vessels in a bleb 1 week after trabeculectomy. If the flow through the scleral flap seems inadequate in the first few days postoperatively (ie, high IOP) and obstruction of the internal opening has been ruled out by gonioscopy, measures to increase the flow through the flap can be used. These include digital pressure (ocular/digital massage) and release of sutures (laser suture lysis or releasable sutures). Digital pressure is applied to the eye either at the limbus opposite the trabeculectomy site or adjacent to the scleral flap. Bleb elevation and lowering of IOP indicate that aqueous has flowed through the flap. Lack of response to this measure could indicate scleral flap adhesion to the scleral bed or conjunctival adhesion to the sclera. Digital pressure is mostly used as a diagnostic measure prior to performing another method of increasing flow but is sometimes used as a therapeutic measure (ie, the patient is taught to do it a few times a day). When digital pressure is used therapeutically, most surgeons prefer to use it only temporarily to help the bleb form during the maturation period, while others also use it as a long-term adjunctive IOP-lowering measure. Laser suture lysis (LSL) is performed using an argon laser and a suture lysis lens. The conjunctiva is compressed with the lens until the suture becomes visible. A very small spot size (50 microns) of high power (300-800 mW) and short duration (0.02 sec) is then used to cut the flap suture through the conjunctiva. This method is not effective in eyes with severe conjunctival chemosis, congestion, or hemorrhage. Release of sutures is simpler than LSL because it can be done at the slit lamp and it can be done even if the flap sutures are not visible under the bleb. All it requires is that the releasable suture was placed properly with a portion left outside the conjunctiva for easy access. Both LSL and release of sutures should be done in the first 2 weeks after surgery (up to 4 wks if intraoperative mitomycin-C was used). Only one suture should be lysed or released at a time to reduce the risk of a sudden drop in IOP. Immediate elevation of the bleb and lowering of IOP indicate a successful suture release. Occasionally, gentle application of digital pressure is needed immediately after the suture release if adhesions have developed around the scleral flap. Bleb needling can be performed in the immediate postoperative period or months to years after the trabeculectomy. [24, 25, 26, 27] When subconjunctival and subflap adhesions have developed or are suspected to have developed, the usual measures to increase aqueous flow and reduce inflammation may no longer be effective. When this occurs, bleb needling may be needed to break the adhesions. There are many techniques of bleb needling. One technique is to use a G25 or G27 needle on a tuberculin syringe loaded with the antifibrotic agent of choice (usually 5-FU). This is inserted into the conjunctiva at least 7-8 mm away from the scleral flap edge, avoiding blood vessels as much as possible. The needle is then brought toward the flap, sweeping the bevel from side to side as it approaches. The bleb may begin elevating already at this point. If necessary, the needle can even be inserted under the flap if the flap edges are visible. Before fully withdrawing the needle, the antifibrotic is injected into the peribleb area the same way it is done for a simple antifibrotic injection. The potential serious complications of this procedure include choroidal effusion, suprachoroidal hemorrhage, blebitis, hypotony, and bleb leak. The postoperative IOP may be low due to excessive flow of aqueous through the trabeculectomy site or due to ciliary body hyposecretion. Possible indicators of excessive flow are a very high and/or very diffuse bleb and a shallow anterior chamber. However, the bleb may be low if there is an associated bleb or wound leak and the anterior chamber may be normal in depth. Conservative management of excessive flow (whether the excessive flow is through the scleral flap to the subconjunctival space, through a bleb or wound leak to outside the eye, or both) includes reducing the anti-inflammatory treatment to allow some scarring and external tamponade using a large diameter contact lens, a Simmons shell, or patching. If conservative measures fail or are inadequate, flap and/or conjunctival sutures can be added or revised, but this additional surgery increases the risk of bleb failure. The initial postoperative IOP measurements could be influenced by residual effects of the patient's previous topical IOP-lowering medications. If possible, oral medication (ie, acetazolamide) should be substituted for the topical medications several days to 2 weeks before the trabeculectomy. The rapid washout period of acetazolamide allows for a more accurate idea of the effect of surgery on the postoperative IOP. Use the smallest needle possible (eg, gauge 30) when injecting subconjunctival anesthesia to reduce the chance of bleeding and creating a buttonhole. Try to insert the needle in a spot where the conjunctiva will eventually be incised. Use high magnification when placing the corneal bridle suture. This reduces the likelihood of corneal penetration or creating a suture track that is too shallow. Cataract surgeons are used to making a paracentesis incision directed toward the pupil to be able to manipulate the lens. But for a trabeculectomy where contact with the lens must be avoided, it is better to direct the paracentesis incision parallel to the limbus, especially when operating on a phakic eye. See the image below. Some elderly individuals have developed spontaneous disinsertion of the Tenon capsule. If the Tenon capsule insertion cannot be found, do not aggressively manipulate the episclera in an attempt to find it. 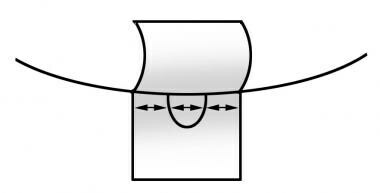 When dissecting the posterior sub-Tenon pockets, orient the curvature of the scissors to match the curvature of the globe to make the dissection easier and smoother. When dissecting very far posteriorly keep in mind the location of the optic nerve and vortex veins. Keep the conjunctiva moist throughout the procedure to keep the cut edges from rolling up and to reduce postoperative conjunctival inflammation. When inserting sponges (also referred to as "onlay" type of antifibrotic application), grasp the leading side of the antifibrotic-soaked sponge with the tip of the forceps and grasp the body of the sponge with the blades of the forceps. This prevents the sponge from curling or crumpling as it is inserted and allows it to lay flat under the conjunctiva. It is safer and more efficient to use a few large sponges than many small ones. Minimal resistance from the scleral tissue when performing the lamellar scleral flap dissection toward the limbus indicates that the dissection is continuing in the same plane. Increased resistance indicates that different planes are being dissected. This makes dissection more difficult and could produce a flap of varying thickness. Whenever possible, the sides of the scleral flap should not be cut flush to the limbus. The dissection of the scleral flap is continued as a short tunnel 1-2 mm beyond the anterior limit of the sides of the flap. This encourages aqueous flow posteriorly rather than along the limbus and it helps prevent limbal leaks when using a fornix-based conjunctival flap. However, this is difficult for beginners because the limbal landmarks are not easily visible. It is also not compatible with the blade or scissors technique of creating the sclerostomy and it may make the insertion of the scleral punch difficult. See the image below. Before inserting the punch under the flap and into the AC, apply pressure to the handle so that the cutting edges move closer together. This improves the steadiness of the punch as the cut is made. Once the punch tip is inside the AC but before the cut is made, reorient the punch so that it is almost perpendicular to the limbus and tug gently. Resistance indicates that the lip of the internal incision is well engaged. This helps create a full-thickness punch with nonshelved edges. See the image below. To achieve an iridectomy with a wide base, hold the scissors parallel to the limbus, pull the iris away from the scissors while a first cut is made, and then push the iris toward the scissors while a second cut is made to complete the iridectomy. When pulling the iris to make the iridectomy, seeing a peaked pupil indicates a good grasp on the iris. Be wary of cutting the iris if the entire pupillary border is not visible because this could lead to an inadvertent sector iridectomy. Some surgeons prefer to pre-place the first 1 or 2 flap sutures before AC entry. This allows rapid closure of the scleral flap and lowers the risk of transient severe hypotony, which is thought to lead to suprachoroidal hemorrhage and the phenomenon of loss of central vision postoperatively (ie, wipe out or snuff out) in eyes with advanced glaucomatous visual field loss. [28, 29] However, pre-placing sutures can be difficult due to the need for careful arrangement of the loose suture ends and the high likelihood of snagging or snarling the suture. This is especially important for eyes with advanced optic nerve damage and floppy eyes (eg, vitrectomized, highly myopic). An AC maintainer or viscoelastic can help stabilize the anterior chamber and prevent hypotony. Injecting a small bolus of air behind the antifibrotic agent to tamponade the injection site may help minimize the incidence of corneal toxicity. The complications of trabeculectomy can be classified into intraoperative, early postoperative, and late postoperative. Trabeculectomy can be performed simultaneously with other procedures such as cataract surgery, keratoplasty, and vitrectomy if warranted by the clinical situation. The most common combination is trabeculectomy with cataract surgery because of the high incidence of cataracts in patients with glaucoma. Cairns JE. Trabeculectomy. Preliminary report of a new method. Am J Ophthalmol. 1968. 66:673-9. [Medline]. Al-Haddad C, Abdulaal M, Al-Moujahed A, Ervin AM. Fornix-based versus limbal-based conjunctival trabeculectomy flaps for glaucoma. Cochrane Database of Systematic Reviews. 2015 November. CD009380. [Medline]. Wells AP, Cordeiro MF, Bunce C, Khaw PT. Cystic bleb formation and related complications in limbus- versus fornix-based conjunctival flaps in pediatric and young adult trabeculectomy with mitomycin C. Ophthalmology. 2003. 110:2192-7. [Medline]. Hill RA. Tenon's traction sutures: an aid for trabeculectomy and aqueous drainage device implantation. 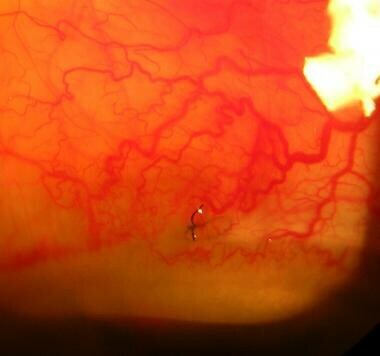 J Glaucoma. 2002. 11:529-30. [Medline]. Heuer DK, Parrish RK 2nd, Gressel MG, Hodapp E, Palmberg PF, Anderson DR. 5-fluorouracil and glaucoma filtering surgery. II. A pilot study. Ophthalmology. 1984. 91:384-94. [Medline]. Chen CW. Ehanced intraocular pressure controlling effectiveness of trabeculectomy by local application of mitomycin-C. Trans Asia-Pacific Acad Ophthalmol. 1983. 9:172. The Fluorouracil Filtering Surgery Study Group. Five-year follow-up of the Fluorouracil Filtering Surgery Study. Am J Ophthalmol. 1996. 121:349-66. [Medline]. Parrish RK 2nd, Schiffman JC, Feuer WJ, Heuer DK; Fluorouracil Filtering Surgery Study Group. Prognosis and risk factors for early postoperative wound leaks after trabeculectomy with and without 5-fluorouracil. Am J Ophthalmol. 2001. 132:633-40. [Medline]. Apostolov VI, Siarov NP. Subconjunctival injection of low-dose Mitomycin-C for treatment of failing human trabeculectomies. Int Ophthalmol. 1996-1997. 20:101-5. [Medline]. Chen CW, Huang HT, Bair JS, Lee CC. Trabeculectomy with simultaneous topical application of mitomycin-C in refractory glaucoma. J Ocul Pharmacol. 1990. 6:175-82. [Medline]. WuDunn D, Cantor LB, Palanca-Capistrano AM, Hoop J, Alvi NP, Finley C, et al. A prospective randomized trial comparing intraoperative 5-fluorouracil vs mitomycin C in primary trabeculectomy. Am J Ophthalmol. 2002. 134:521-8. [Medline]. Palanca-Capistrano AM, Hall J, Cantor LB, Morgan L, Hoop J, WuDunn D. Long-term outcomes of intraoperative 5-fluorouracil versus intraoperative mitomycin C in primary trabeculectomy surgery. Ophthalmology. 2009. 116:185-90. [Medline]. Singh K, Mehta K, Shaikh NM, Tsai JC, Moster MR, Budenz DL, et al. Trabeculectomy with intraoperative mitomycin C versus 5-fluorouracil. Prospective randomized clinical trial. Ophthalmology. 2000. 107:2305-9. [Medline]. Weinreb RN, Crowston JG. Glaucoma Surgery Open Angle Glaucoma. 2005. De Fendi LI, Arruda GV, Scott IU, Paula JS. Mitomycin C versus 5-fluorouracil as an adjunctive treatment for trabeculectomy: a meta-analysis of randomized clinical trials. Clin Exp Ophthalmol. 2013 Nov. 41:798-806. [Medline]. Khouri AS, Huang G, Huang LH. Intraoperative Injection vs Sponge-applied Mitomycin C during Trabeculectomy: One-year Study. Journal of Current Glaucoma Practice. 2017 Oct 27. 11:101-106. [Medline]. [Full Text]. Cheng JW, Cheng SW, Wei RL, Lu GC. Anti-vascular endothelial growth factor for control of wound healing in glaucoma surgery. Cochrane Database of Systematic Reviews. 2016 Jan. CD009782. [Medline]. [Full Text]. Kolker AE, Kass MA, Rait JL. Trabeculectomy with releasable sutures. Trans Am Ophthalmol Soc. 1993. 91:131-41. [Medline]. Johnstone MA, Wellington DP, Ziel CJ. A releasable scleral-flap tamponade suture for guarded filtration surgery. Arch Ophthalmol. 1993. 111:398-403. [Medline]. Maberley D, Apel A, Rootman DS. Releasable "U" suture for trabeculectomy surgery. Ophthalmic Surg. 1994. 25:251-5. [Medline]. Thomas R, Jacob P, Braganza A, Mermoud A, Muliyil J. Releasable suture technique for trabeculectomy. Indian J Ophthalmol. 1997. 45:37-41. [Medline]. Wells AP, Bunce C, Khaw PT. Flap and suture manipulation after trabeculectomy with adjustable sutures: titration of flow and intraocular pressure in guarded filtration surgery. J Glaucoma. 2004. 13:400-6. [Medline]. Davis AP. A fully adjustable suture for trabeculectomy. Ophthalmic Surg Lasers Imaging. 2006. 37:252-6. [Medline]. Hodge W, Saheb N, Balazsi G, Kasner O. Treatment of encapsulated blebs with 30-gauge needling and injection of low-dose 5-fluorouracil. Can J Ophthalmol. 1992. 27:233-6. [Medline]. Mardelli PG, Lederer CM Jr, Murray PL, Pastor SA, Hassanein KM. Slit-lamp needle revision of failed filtering blebs using mitomycin C. Ophthalmology. 1996. 103:1946-55. [Medline]. Rotchford AP, King AJ. Needling revision of trabeculectomies bleb morphology and long-term survival. Ophthalmology. 2009. 115:1148-1153. [Medline]. Anand N, Khan A. Long-term outcomes of needle revision of trabeculectomy blebs with mitomycin C and 5-fluorouracil: a comparative safety and efficacy report. J Glaucoma. 2009. 18:513-20. [Medline]. Costa VP, Smith M, Spaeth GL, Gandham S, Markovitz B. Loss of visual acuity after trabeculectomy. Ophthalmology. 1993. 100:599-612. [Medline]. Law SK, Nguyen AM, Coleman AL, Caprioli J. Severe loss of central vision in patients with advanced glaucoma undergoing trabeculectomy. Arch Ophthalmol. 2007. 125:1044-50. [Medline]. Shingleton BJ, Jacobson LM, Kuperwaser MC. Comparison of combined cataract and glaucoma surgery using planned extracapsular and phacoemulsification techniques. Ophthalmic Surg Lasers. 1995. 26:414-9. [Medline]. Tezel G, Kolker AE, Kass MA, Wax MB. Comparative results of combined procedures for glaucoma and cataract: I. Extracapsular cataract extraction versus phacoemulsification and foldable versus rigid intraocular lenses. Ophthalmic Surg Lasers. 1997. 28:539-50. [Medline]. Chia WL, Goldberg I. Comparison of extracapsular and phaco-emulsification cataract extraction techniques when combined with intra-ocular lens placement and trabeculectomy: short-term results. Aust N Z J Ophthalmol. 1998. 26:19-27. [Medline]. Kosmin AS, Wishart PK, Ridges PJ. Long-term intraocular pressure control after cataract extraction with trabeculectomy: phacoemulsification versus extracapsular technique. J Cataract Refract Surg. 1998. 24:249-55. [Medline]. Wyse T, Meyer M, Ruderman JM, Krupin T, Talluto D, Hernandez R, et al. Combined trabeculectomy and phacoemulsification: a one-site vs a two-site approach. Am J Ophthalmol. 1998. 125:334-9. [Medline]. Buys YM, Chipman ML, Zack B, Rootman DS, Slomovic AR, Trope GE. Prospective randomized comparison of one- versus two-site Phacotrabeculectomy two-year results. Ophthalmology. 2008. 115:1130-3. [Medline]. Derick RJ, Evans J, Baker ND. Combined phacoemulsification and trabeculectomy versus trabeculectomy alone: a comparison study using mitomycin-C. Ophthalmic Surg Lasers. 1998. 29:707-13. [Medline]. Yu CB, Chong NH, Caesar RH, Boodhoo MG, Condon RW. Long-term results of combined cataract and glaucoma surgery versus trabeculectomy alone in low-risk patients. J Cataract Refract Surg. 1996. 22:352-7. [Medline]. Naveh N, Kottass R, Glovinsky J, Blumenthal M, Bar-Sever D. The long-term effect on intraocular pressure of a procedure combining trabeculectomy and cataract surgery, as compared with trabeculectomy alone. Ophthalmic Surg. 1990. 21:339-45. [Medline]. Friedman DS, Jampel HD, Lubomski LH, Kempen JH, Quigley H, Congdon N, et al. Surgical strategies for coexisting glaucoma and cataract: an evidence-based update. Ophthalmology. 2002. 109:1902-13. [Medline]. Chen PP, Weaver YK, Budenz DL, Feuer WJ, Parrish RK 2nd. Trabeculectomy function after cataract extraction. Ophthalmology. 1998. 105:1928-35. [Medline]. Manoj B, Chako D, Khan MY. Effect of extracapsular cataract extraction and phacoemulsification performed after trabeculectomy on intraocular pressure. J Cataract Refract Surg. 2000. 26:75-8. [Medline]. Halikiopoulos D, Moster MR, Azuara-Blanco A, Wilson RP, Schmidt CM, Spaeth GL, et al. The outcome of the functioning filter after subsequent cataract extraction. Ophthalmic Surg Lasers. 2001. 32:108-17. [Medline]. Casson RJ, Riddell CE, Rahman R, Byles D, Salmon JF. Long-term effect of cataract surgery on intraocular pressure after trabeculectomy: extracapsular extraction versus phacoemulsification. J Cataract Refract Surg. 2002. 28:2159-64. [Medline]. Husain R, Liang S, Foster PJ, Gazzard G, Bunce C, Chew PT, et al. Cataract surgery after trabeculectomy: the effect on trabeculectomy function. Arch Ophthalmol. 2012 Feb. 130(2):165-70. [Medline]. Shingleton BJ, Alfano C, O'Donoghue MW, Rivera J. Efficacy of glaucoma filtration surgery in pseudophakic patients with or without conjunctival scarring. J Cataract Refract Surg. 2004. 30:2504-9. [Medline]. Wagschal LD, Trope GE, Jinapriya D, Jin YP, Buys YM. Prospective Randomized Study Comparing Ex-PRESS to Trabeculectomy: 1-Year Results. Journal of Glaucoma. 2015 Oct-Nov. 24:624-9. [Medline]. Cillino S, Di Pace F, Cillino G, Casuccio A. Biodegradable collagen matrix implant vs mitomycin-C as an adjuvant in trabeculectomy: a 24-month, randomized clinical trial. Eye. 2011 Dec. 25:1598-606. [Medline]. Khairy HA, Elsawy MF. Trabeculectomy With Mitomycin-C Versus Trabeculectomy With Amniotic Membrane Transplant: A Medium-term Randomized, Controlled Trial. Journal of Glaucoma. 2015 Sept. 24:556-9. [Medline]. Wang X, Khan R, Coleman A. Device-modified trabeculectomy for glaucoma. Cochrane Database of Systematic Reviews. 2015 Dec. CD010472. [Medline].